Our IP68 rated Waterproof Mini LED Dimmer with RF Remote is an amazing 5-24VDC LED dimmer that provides smooth LED dimming from 5-100%. Don't let the small size fool you this controller boasts 12A of maximum output power or 60W at 5VDC, 144W at 12VDC, and 288W at 24VDC. The 16AWG bare wire leads make connecting your dimmer simple for any indoor or outdoor 5-24VDC Constant Voltage installation. The RF remote has a number of pre-set dimming levels for quick and easy dimming. Dimming levels will be remembered when 5-24VDC is turned off and back on. An IP68 rating makes this product waterproof for any outdoor LED project but is not designed to be submersed or directly exposed to outdoor elements. Each RF remote includes one 3V CR2025 battery for operation. Our Ribbon Star 5050 waterproof strip light is an ideal solution for both indoor and outdoor backlight and task lighting applications that require a commercial grade, long lasting linear strip light. All of our UL Listed 5050 waterproof strips are encased in a waterproof silicon coating for an IP66 rating (non-submersible). This 118" (3 meters, 2" under ten feet) ribbon can be cut every two inches and re-connected for custom lighting layouts. Ribbon comes with 3M™ VHB™ mounting tape on the back, for the best long-term mounting solution. Each roll comes with 10 clear plastic screw down holders, 4 closed end caps, 4 end caps with holes for wiring, and a waterproof connector at each end. Three (3) 5050 SMD LEDs per 2", 4.6W per foot of Constant Voltage DC power required for this strip of light. Can be used for outdoor lighting, decks, patios, coves lighting, toe kicks, under cabinet, backlighting, crown molding and many more applications. 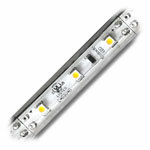 UL Listed for class 2 luminaries and fixtures, RoHS and CE approved, 3000-3500K Color Temperature. This product is not intended to be submersed for extended periods. This small yet powerful waterproof signal amplifier will extend a PWM dimming signal from your 5-24VDC LED dimmer to an additional 12 amps of single color LED lights. A signal amplifier is typically needed for larger LED light installations where you would like to dim a large amount of LED lights off of one dimmer. 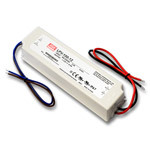 Once you have met the power limitations of your PWM dimmer you can use this amplifier to dim an additional 12A of 5-24VDC constant voltage LED lights. 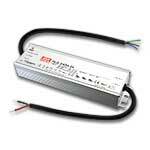 The max 12A rating allows for 60W of dimming at 5VDC, 144W at 12VDC and 288W at 24VDC. 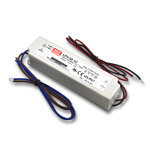 Simple to use bare lead wires make for a painless installation to any new or existing PWM dimming system. This product is IP68 waterproof rated and not meant to be submersed or directly exposed to any outdoor elements.